In this chapter the foundations and tools for the configuration of stability criteria for intact stability and damage stability are discussed. The particular menu option for this task can be found in the Config module, which is also accessible through the [Setup]→[Project setup] function, top-left in (almost) every PIAS window. The core is a set of stability criteria. Such a set can be valid for intact stability or damage stability. Multiples of such sets are supported, in the first place to support different criteria sets for intact stability and damage stability, but also to be able to toggle quickly between multiple types of criteria (for example in case of multiple navigation areas, where different stability criteria may apply). A set of criteria contains multiple individual criteria. Such an individual criterion has a simple structure (e.g. ‘minimum metacentric height’ or ‘area under the GZ curve within a range of 20 degrees’) and can be dependant on certain parameters (such as ‘a minimum metacentric height of 30 cm’). Such a parameter can either be a number, or a variable from which the numerical value is determined dynamically by the program (such as the concept ‘top of the GZ curve’). From the set of stability criteria quite some standard sets of stability requirements have been preprogrammed (such as the ‘Intact Stability Code’), however, this is merely a kind of service, because in the end the definition is captured within the individuals criteria, just as each user is able to do manually. It is recommended to generate and check intermediate results in case of unclear or unexpected results. This can be set in the fourth column of the main menu of sets of stability criteria, see Manipulating and selecting sets of stability criteria. The major part of this chapter deals with the setup of stability criteria, however, it is recommended also to visit the last two paragraphs. One contains a number of FAQs on specific stability questions, this can be found in Answers to frequently asked questions on stability assessments. The other deals with the availability of criteria, and also contains a number of disclaimer remarks, please see On the various criteria and parameters for those subjects. Non-watertight openings are fully taken into account while assessing the GZ curve. That does not separately has to be turned on or off. The words ‘requirement’ and ‘criterion’ are used in a mixed fashion, they have the same meaning (here). Especially read the example described in the attention of Variants for standard sets of stability requirements about how to handle the creation of standard stability criteria. A database is available which contains stability criteria that are not included as standard in PIAS. If one downloads this database than it is recommended to read the, in the database available, ‘Readme.docx’ file first. This file contains information regarding importing the ‘.req’ files. Press this link to download the non standard included stability criteria. There is a document available with information regarding this database but that is only transmitted on request. With the <Enter> key (or mouse double click) one goes one level deeper into the stability criterion, where all specific parameters can be given. That menu is discussed in Manipulating individual criteria. The names of the different sets of criteria can be defined and altered by the user. In the example, one name appears twice; these are sets of criteria that are applicable to different calculations, but originate from the same regulations. The user could also define different names here. The different sets of criteria can be selected individually. This enables fast switching between different sets of criteria for the output of calculations. Upon selecting the cell in this column a popup menu will open up (from which an example is depicted below) which enables selecting a criterion set, for the types of calculations as defined in the column ‘Applicable for’. This column shows the type of calculations to which a set of criteria applies. Changing the applicability of a set of calculations can be done through a popup menu, from which an example is depicted in the second figure below. In this column it can be specified whether and how intermediate results should be written to text file (with extension .str). As such a file may becomes rather bulky, it is possible to rewrite the file each time again, in which case the previous intermediate results will be lost. In this column the user can define additional comments. With [Merge] two sets of criteria can be merged. This can sometimes prove to be handy when manipulating criteria sets, or in combination with import or export actions. The option [Merge] only works when one makes a copy of a set of criteria, through ‘Copy a row entirely’ see Copy, paste etc., which thereafter can be merged in any other set of criteria than itself. With [Standard], standard stability criteria can be created, this is further discussed in Select standard stability criteria. [File] has two sub options: import and export, which can be applied to read or write a set of criteria from or to another PIAS criteria file. This option can, for example, be used to exchange a non-standard set of criteria with another project. When exporting, the selected criteria set — the one where the text cursor resides — is added to the specified file. On import a list of in the import file present criteria sets is displayed. From this list one can choose one criteria set which should actually be imported. This function - activated by [Standard] in the window of criteria sets - will add a set of criteria to the already existing sets. Through popup menus a choice is made from the predefined sets of standard criteria for intact or damaged stability. First the choice for intact or damage stability criteria is made, as illustated in the figure below. Subsequenlty, depending on the choice, a popup menu with the available predefined sets of intact or damaged stability opens up, this will be discussed in the next sections. Choice for intact or damage stability criteria. A number of standard stability requirements have been preprogrammed. Below is a list with references to the chapters with short references to the sources of the requirements in that chapter. Standard criteria for intact stability, seagoing. Intact Stability Code 2008, almost identical to its predecessors IMO A.749 and IMO A.562. These regulations contain a subcriterion, stating that the statical angle due to wind may not be larger than 80% of the angle of deck immersion. Traditionally, and also today, PIAS determines this angle at Lpp/2. However, in 2006 it appeared that a regulatory body may require that the effect of trim is included. 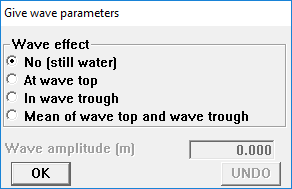 In that case the user will have to apply the variable ‘Angle of deck edge immersion’ instead of ‘Angle of deck immersion at L/2’ in this criterion. 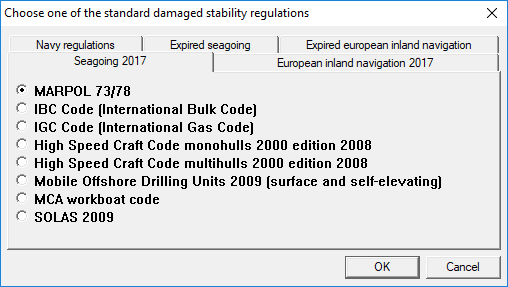 The Intact Stability Code also includes the so-called weather criterion, for which the roll data of the ship have to be specified, see for the definition menu Roll data (for Intact Stability Code weather criterion). This regulation is almost identical to the earlier mentioned Intact Stability Code standard stability criteria regulation but then with changes for the so-called ‘supply vessels’, meaning that the minimum angle of GZ-max will then be decreased to 15°, which will be compensated by a larger area under the GZ curve up to that angle. In accordance with reg. 2.4.5.2 of the IS Code. International Code of Safety for High-Speed Craft (2000), 2008 Edition, annex 8.
International Code of Safety for High-Speed Craft (2000), 2008 Edition, annex 7. Intact Stability (IS) Code 2008, Part A, chapter 3.3. Intact Stability (IS) Code 2008, Part A, chapter 3.4. Which is practiclly similar to, International Code for the Safe Carriage of Grain in Bulk, MSC.23(59), 1 January 1994. According to this Code the angles 12° and 40° should explicitly be included into the calculations. So, please take care that these angles are part of the range of heeling angles, as specified in Config. IS Code 2008, part B, chapter 2.2 or IMO A749(18) chapter 4.7, 4 nov 1993: Code on intact stability for all types of ships covered by IMO instruments. Code for the Construction and Equipment of Mobile Offshore Drilling Units, 2009 (MODU Code). Only surface and self-elevating. The residual area between the righting lever curve and the heeling lever curve should not be less than 0.070 meter-radians. The area is determined from the first intersection of the two curves or the angle of down-flooding, whichever is less. The maximum residual righting lever GZ between the righting lever curve and the heeling lever curve should be at least 0.2 meter. Just as with the NMD and BV criteria, a total load case (that is ship & anchor chain force) is tested here. With just the application of these criteria the maximum permissible anchor chain force is not determined, for that purpose module Maxchain, should be used. The required criteria from the ‘Intact Stability (IS) Code 2008’ for container vessels greater than a 100 meter. The Workboat Code Industry Working Group Technical Standard, June 2014, MS 183/01/23. According to BadS 124/1977: 20% added to the standard criteria. Netherlands Shipping Inspection (NSI). Marine Order 43 (Cargo and cargo handling — livestock) 2006. Standard criteria for intact stability, european inland navigation. Type C tankers, reg. 9.3.2.14.2. Type N tankers, reg. 9.3.3.14.2. ADN, European Agreement concerning the International Carriage of Dangerous Goods by Inland Waterways, reg. 9.3.1.14. ADN, European Agreement concerning the International Carriage of Dangerous Goods by Inland Waterways, reg. 9.3.2.14. ADN, European Agreement concerning the International Carriage of Dangerous Goods by Inland Waterways, reg. 9.3.3.14. Directive of the European parliament and of the council, 2006/87/EU reg. 15.03. Directive of the European parliament and of the council, 2006/87/EU reg. 17.07/17.08. Directive of the European parliament and of the council, 2006/87/EU reg.22.02 and 22.03. BVR (Binnenvaartregeling) 2009, Appendix 3.6. Intact criteria according Bundesamt fur verkehr, Switzerland, Verordnung 1976. Intact criteria according Bundesamt fur Verkehr, Switzerland. Standard criteria for intact stability, navy regulations. Specific criteria for American naval vessels. Specific criteria for some vessels of the Royal Dutch Navy. Stability criteria for the Royal Dutch Navy marine according to Report Nr. 21183/21021/SB of the Ministry of Defence. NES 109 criteria for conventional ships (either ‘issue 3’ or ‘issue 4’). NES 109 issue 3 and 4. These criteria are very similar to those of BV, ‘Rules for the Classification of Naval Ships, Part B, chapter 3, section 2’. The differences are mainly in the applied criterion values. 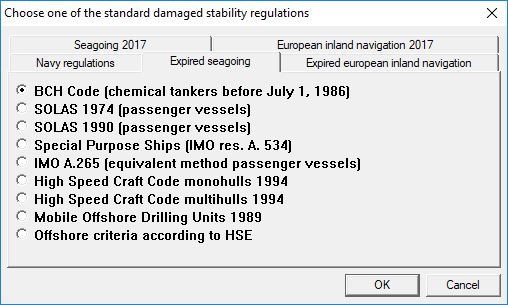 Standard criteria for intact stability, expired seagoing. International Code of Safety for High-Speed Craft. MSC.36(63), 20 May 1994. Criteria for offshore vessels according to HSE (DoE) and NMD. These criteria evaluate a total load case (which is ship & anchor chain force) for compliance with NMD's Guidelines for immediate measures on supply ships and tugs that are used for anchor handling (2007). The anchor chain force should be defined acting at CL, because the NMD criteria require a certain ratio between the lever at the top of the GZ curve and the lever at the intersection between righting and heeling levers. In order for this ratio to appear, one should not include the heeling moment by placing the anchor chain force off-centerline. So the chain force should be assumed to exert on the real chain position longitudinally and vertically, but always at center line. By the way, with only the application of these criteria the maximum permissible anchor chain force is not determined, for that purpose module Maxchain, should be used. ISO/DIS 12217, stability and buoyancy assessment and categorization, Part 2: Sailing boats of hull length greater than or equal to 6 m, 2000-10-05. ISO/DIS 12217, stability and buoyancy assessment and categorization, Part 1: Non-sailing boats of 6 m length of hull and over, 2000-10-05. The tug criteria, of Bureau Veritas (D.14.2, reg. 2.2.2), have been replaced with the ‘Intact stability Code 2020’ criteria for self and tow tripping. In the Bureau Veritas regulations this can be found under, Part E, chapter 1, section 2, regulation 2. 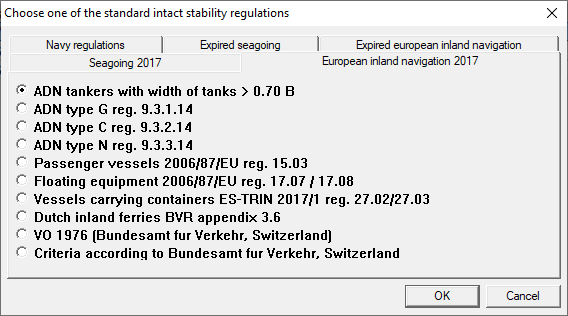 Standard criteria for intact stability, expired european inland navigation. 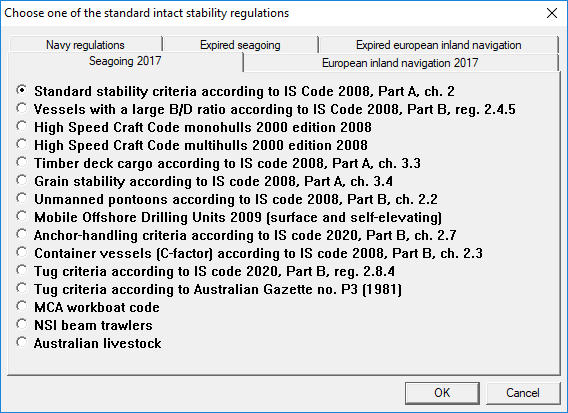 In the pre-2017 versions of PIAS, during the creation of standard intact stability criteria one would be asked the question to add other criteria, like tugs criteria, NSI interpretation and grain criteria or Australian livestock moment, to the to be created stability criteria. These choices are now integrated as standard criteria. When one for example wants to create intact criteria with grain criteria now has to create two standard sets of stability criteria, namely ‘Standard stability criteria according to IS Code 2008, Part A, ch. 2’ and ‘Grain stability according to IS Code 2008, Part A, ch. 3.4’ and then merge together them with the option [Merge], as discussed in Manipulating and selecting sets of stability criteria. From now on this the way to handle standard stability criteria where this is applicable. For some standard sets of stability criteria, additional choices must be made. If so, a popup menu appears after selecting the standard set of criteria. Most of the options in these popup menus determine whether or not additional criteria are applicable and sometimes a value must be entered for a variable. For a description of the variables reference is made to Manipulating individual criteria and to Defining heeling moments to be accounted for. For other sets of standard criteria, an additional choice can be made, as shown in the example below. For the determination of such choices and requested values, reference is made to the relevant regulations. Supplementary parameters Dutch inland ferries BVR appendix 3.6. These are, similar to the intact stability criteria, also presented in a popup window. Below is a reference list to the corresponding chapter which contains a table with short reference to the source of the regulations. 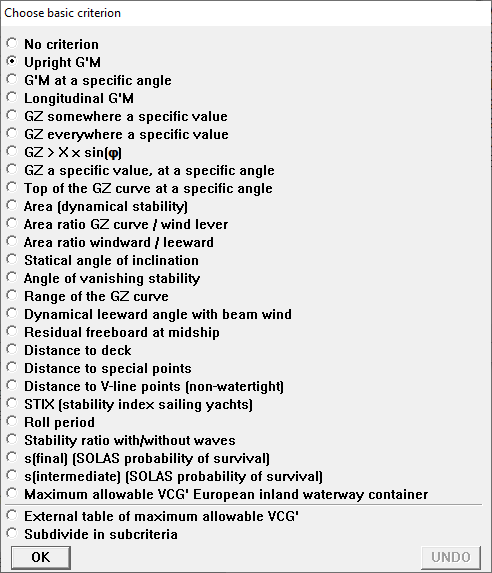 Sets of predefined criteria for damage stability, seagoing. International Code of Safety for High-Speed Craft (2000), 2008 Edition, annex 8. Note that the range can be reduced to 10 degrees if the area under the curve is increased by a factor of 15/range, see paragraph 2.1.1. Also note that these criteria make use of evacuation points which can be defined in Openings. Criteria according MODU Code 2009, only surface and self-elevating. In article 3.4.1 it is stated that the range of stability has to be determined over the positive stability but that range is determined without the influence of the downflooding angle. In PIAS the downflooding angle is always used and also in this exceptional situation the downflooding angle has been taken into account. This is therefore in deviation with the stated regulations. If this applies to you then please contact SARC. SOLAS 2009, Consolidated text 2014. Sets of predefined criteria for damage stability, european inland navigation. ADN, European Agreement concerning the International Carriage of Dangerous Goods by Inland Waterways, reg. 9.3.1.15. ADN, European Agreement concerning the International Carriage of Dangerous Goods by Inland Waterways, reg. 9.3.2.15. ADN, European Agreement concerning the International Carriage of Dangerous Goods by Inland Waterways, reg. 9.3.3.15. Directive of the European parliament and of the council, 2006/87/EU reg. 22a.04. Damaged criteria according Bundesamt fur verkehr, Switzerland, Verordnung 1976. Damaged criteria according Bundesamt fur Verkehr, Switzerland. Sets of predefined criteria for damage stability, navy regulations. Specific criteria for Dutch naval vessels. Stability criteria for the Royal Dutch Navy according to Report Nr. 21183/21021/SB of Dutch Ministry of Defence. NES 109. These criteria are very similar to those of BV, ‘Rules for the Classification of Naval Ships, Part B, chapter 3, section 3’. The differences are mainly in the applied criterion values. Sets of predefined criteria for damage stability, expired seagoing. Code for the Construction and Equipment of Ships Carrying Dangerous Chemicals in Bulk, 1993. Special Purpose Ships Code IMO A.534. Regulation 5 of IMO A.265. Criteria according to HSC Code monohull passenger vessels 1994. 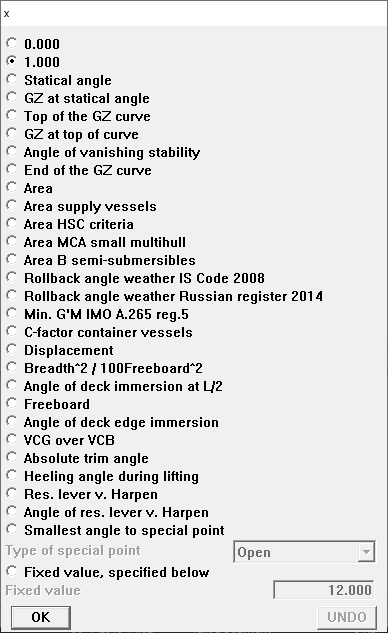 Criteria according to HSC Code multihull passenger vessels 1994. Criteria according to MODU Code 1989. 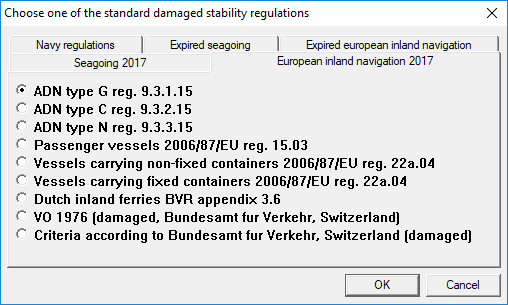 Sets of predefined criteria for damage stability, expired european inland navigation. According to Dutch Binnenschepenbesluit, Stbl. 466, or, alternatively according to Bundesamt für Verkehr, Switserland. For every individual criterion the user may choose to draw a GZ curve in the output. This is only useful for some types of criteria, such as a certain area under the curve or a static angle of inclination due to a (wind or other) heeling moment. In the tables of maximum allowable KG' values, no curves are drawn at all. If this option is not selected for any criterion, a GZ curve is still drawn in the output for the stability calculations for a loading condition, only without any hatching of areas etc. For each criterion a name can be given. This will be used in the output for identification purposes. The criteria as listed below include some where the other side of the GZ curve (i.e. left of the origin) play a role, such as ‘Area ratio windward / leeward’ en ‘Dynamical leeward angle with beam wind’. If the computation setting of Calculate intact stability etc. with a heeling to (and its relative for damage stability) is ‘Portside and starboard’, then the complete GZ curve from PS to SB is computed and available, so those stability criteria can be evaluated complete and correct. However, with any other setting the stability will be computed to just a single side, and will be mirrored to the other side — after all, no other information is available in this case. In case of asymmetrical hull forms or damage cases that might be less accurate than a full computation. No criterion is automatically selected for a newly added criterion, so that if a requirement is not explicitly defined, (including type), it will not influence the calculation. The tangent to the GZ-curve may vary considerably in an area where teh GZ-curve has a large curvature. To be able to determine G'M accurately, in such areas a sufficient number of angles of inclinations (see therefore Angles of inclination for stability calculations) should be used (because the GZ-curve is formed by a calculation at those angles, inbetween is only interpolated). If the angle at which the G'M must be determined is zero, then the G'M according to this criterion is theoretically exactly the same as according to the criterion discussed just above. And practically also (provided there are sufficient angles if the curve in that neighborhood is rather curved). The comments made under Maximum allowable VCG at criterion `GM at equilibrium' also apply to this criterion. The longitudinal G'M in upright position must have a certain value. Within a certain range, the GZ value must be larger than a certain value somewhere. Within a certain range, the GZ value must be larger than a certain value everywhere. Within a certain range, the GZ value must be larger than a certain value times the sinus of the angle of inclination somewhere. The GZ must be larger than a certain value at a certain angle. The top of the GZ curve must lie beyond a certain angle. The area (in meter.radians) under the GZ curve must have a certain value in a certain range. The ratio of the areas A ÷ B under the GZ curve and the wind lever respectively must have a certain value within in a certain range. Area ratio GZ curve / wind lever. The ratio of the areas A ÷ B enclosed by the GZ curve and the wind lever, calculated from a certain rollback angle windward,to a certain angle to lee must have a certain value. Area ratio windward / leeward. The static angle of inclination must be less than a certain value. The angle of vanishing stability must have a certain value. 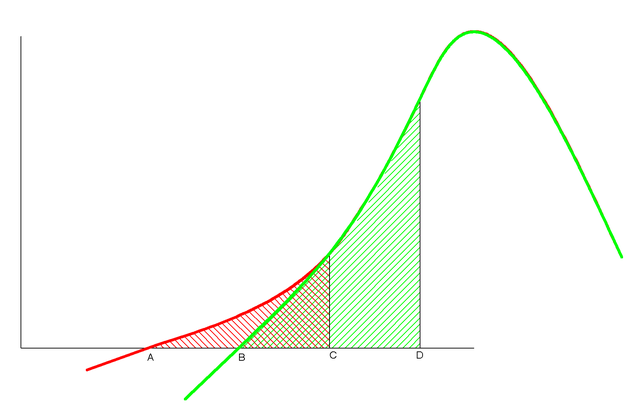 The range of the positive part of the GZ curve must have a certain value, within a certain range. The roll angle to lee due to wind may have a certain maximum value, calculated from a certain rollback angle windward, with a certain factor for wind gust. Dynamical leeward angle with beam wind. The allowable angle leeward due to rolling under the influence of wind is assessed via the hatched surfaces. The area on the right side of the graph equals the area on the left side of the curve. Note: The wind heeling lever is multiplied by a ‘wind gust factor’, see the differences in the wind heeling levers at Wind lever. Both levers are multiplied by the cosine of the heeling angle in the example. The remaining freeboard at half length (as determined from the depth and breadth in Hulldef) must have a certain value at the static angle of inclination. The distance from the waterline to the deckline (as determined from the depth and breadth in Hulldef) must have a certain value at the static angle of inclination. The distance from the waterline to openings or margin line points (as defined in Hulldef) must have a certain value at the static angle of inclination. The distance from the waterline to V-line points (as defined in Hulldef, see Openings) must have a certain value at the static angle of inclination, with a certain roll margin. The coefficient according to the STIX requirement (as defined ISO/DIS 12217, from 2000-10-05) should have a certain value. The roll period as calculated from selected formulae must have a certain value. Available are estimations according to the Irish Maritime Authority (T = 0.7 × B ÷ √G'M), and those according to the Intact Stability Code. The ratio of areas under the GZ curves for calm water and in waves may not exceed a certain value. The probability of survival should be greater than the given value. Applicable to passenger vessels, according to SOLAS 2009 Consolidated text 2014, part B-1, regulation 8-2. Note that the ‘final’ criterion is subjected to the effects of evacuation points. 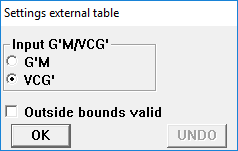 With this criterion the user can enter a table of maximum allowable VCG (or minimum required GM). For more details please refer to Input of externally defined tables of maximum allowable VCG'. European regulations 2006/87/EU contains rules for the stability of (inland waterway) container vessels navigating the river Rhine. These have been pre-programmed, and are readily available in PIAS, while the required ship parameters have to be defined with module Rhine. In the end, these rules provide a maximum allowable VCG, which is used to assess stability where neccessary. A criterion of this type can be defined as a set of criteria of all listed types. Such a set or subset of criteria can be treated, manipulated and defined as an independent set of criteria. It is even possible to create subsets within subsets. This column is only valid for the criterion ‘External table of maximum allowable VCG' ’, because here it can be given to which statical angle of inclination this table is valid. The toolbar function [Determinative] determines whether the most or least critical criterion is normative. In most cases all criteria should be complied with, in which case the bottom line in the window reads ‘The GZ curve must comply with all stated criteria’. However, it may occur that only one of the requirements needs to be complied with, which makes the bottom line to display ‘The GZ curve only needs to comply with 1 of the stated criteria’. With the function [pasTe criterion special] one can copy one specific criterion from an other set of criteria to the current set of criteria. This function is only available when in a set of criteria other than itself with use of ‘Copy a row entirely’, see Copy, paste etc., a copy has been made of a criterion. This also means that this function will not be available when one uses the ‘Copy a row entirely’ in the ‘current’ set of criteria. Example of definition per criterion. The first row contains the user-defined description, see also Manipulating individual criteria. The description can be changed through this menu. The second line contains the type of basic criterion as defined in the menu of Standard stability criteria damaged stability. The type of criterion be changed in this menu with the exception of a few basic criterion such as, ‘No criterion’, ‘Subdivide in subcriteria’ and ‘External table of maximum allowable VCG' ’. Depending on the type of criterion, a number of rows containing the parameters for the concerning criterion follows. In this example there are three user-defined parameters: ‘Maximum leeward angle’, ‘With windward rollback angle’ and ‘And wind gust factor’. Setting these parameters is discussed extensively in The nature of the stability criterion parameters. An overview of possible parameters and their meaning is given in Types of parameters. For each criterion different types of heeling moments can be accounted for (wind heeling moment, turning circle moment, etcetera). Depending on the type of moment, other settings may apply. Defining these moments and their settings is described in Defining heeling moments to be accounted for. Linear moment, so constant for all angles of inclination. Moment decreasing with the cosine of the angle of inclination. Austr. 1981 ABC: moment = bollard pull × (vertical lever × cos(φ) - breadth towing hook from CL × sin(φ)). By the way, this is the same formula as proposed in IMO SDC 3 (2015). Austr. 1981 DE: moment decreases according to the formula from the ‘Commonwealth of Australian Gazette no. P3 (May 11, 1981) sect 8, C10’: moment = bollard pull × (vertical lever x cos(φ+30) - breadth towing hook from CL × sin(φ+30). IS Code 2020, self tripping: according to, MSC 97-22-Add.1, 2.8.4.2. Which is the same formula as used by ‘Austr. 1981 ABC’. IS Code 2020, tow tripping: according to, MSC 97-22-Add.1, 2.8.4.3. The distance between towing hook and the point halfway between draft and the virtual (keel) point, which can be specified with one of the hull definition modules (see Towing hook and bollard pull). The distance between towing hook and half the draft. The distance between towing hook and the COG of the lateral area, which will be computed from the underwater contour shape of the selected wind contour, for example Settings per loading condition. The distance between towing hook and any height from base. The height is defined in Towing hook and bollard pull as a virtual (keel) point. For ‘IS Code 2020, tow tripping’ it is not possible to specify a vertical lever because it can not be applied in the formula in a standard way. For each criterion the GZ curve it can be specified whether the criterion should be applied on the ‘The GZ minus the heeling moments’, or the ‘The GZ curve only’. Some criteria for damage stability (SOLAS 1974, SOLAS 1990 and IMO A.265) are only applicable if more than a certain number of compartments are damaged. This number can be set in this row. Some criteria for damage stability (SOLAS 1974, SOLAS 1990 and IMO A.265) are only applicable if less than a certain number of compartments are damaged. This number can be set in this row. If a wave crest or wave trough is selected, the amplitude must also be specified (on the same row). The GZ curve is then calculated for this criterion with the vessel in a wave with the defined amplitude and a wave length of twice the vessel length, with the crest, respectively the through at half the vessel's length. If the mean of wave crest and trough is selected, the GZ curve is calculated twice (for a wave crest and a wave trough) and for each angle of inclination, the average GZ value is calculated. The criterion is then evaluated for the GZ curve constructed in the described way. This section describes the possible parameters that can be defined depending on the type of basic requirement. Parameter here means: the quantity appearing in the left column, in the rows directly under the ‘Type of criterion’, see picture below the title of Defining the parameters of the stability criteria. Start angle of the range in which a parameter must reach a certain value. [degrees]. Final angle of the range in which a parameter must reach a certain value. [degrees]. Inclination of the tangent of the GZ curve. [m/rad]. The angle at which a parameter must reach a certain value. [degrees]. Metacentric height in longitudinal sense. [m]. Righting moment divided by displacement. [m]. Factor x for a basic requirement in which the key parameter varies, for example with the angle of inclination, in the type of basic criterion: GZ > X × sin(φ). In this example: [m]. The angle belonging to the maximum GZ value. [degrees]. Area under the GZ curve. [mrad]. Ratio of areas under GZ curves or GZ curve and a wind heeling lever curve. [-]. To which angle from the statical angle must be rolled. [degrees]. The rollback angle from the statical angle. [degrees]. 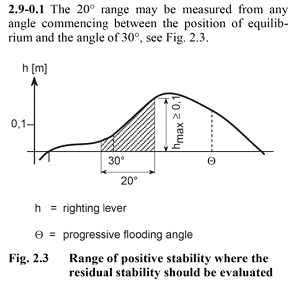 Static angle of inclination at equilibrium (For damage stability at belonging stage of flooding). [degrees]. The angle beyond which the GZ becomes negative or the angle at which the open openings submerse if that is smaller. [degrees]. Range for the positive part of the GZ curve. [degrees]. Allowable angle to lee for assessment of the dynamic wind heeling. [degrees]. Angle windward for assessment of the dynamic wind heeling. [degrees]. Multiplier for wind heeling lever due to constant wind pressure, to account for a wind gust for assessment of the dynamic wind heeling. [-]. Freeboard at 1/2 Lpp at the static angle of inclination. [m]. Required distance from the waterline to the defined deck line points (see Deck line). [m]. The deck line or other points within the length of the damaged part (to be defined in the appropriate module for damage stability) will be taken into consideration, depending on the choice made here. [-]. Defined points are considered at the defined breadth or at breadth=0, depending on the choice made here. [-]. Required distance from the waterline to the defined special points (as defined at ‘openings’ in Hulldef). [m]. The type of special point for which this requirement is applicable can be selected here. [-]. All emergency exits are taken into account in the calculation. An emergency exit in the sense of the ADN criteria. Meaning that, when multiple emergency exits have been connected to a compartment that in the final stage one of those emergency exits should stay above the waterline with a minimum distance of 0.100 meter. Increase of static heeling angle, for which the V-line points must have the defined distance to the waterline. [degrees]. Start angle of roll, only applicable for navy vessels with Vline points. [degrees]. Required value for the stability index. [-]. Option for choosing the estimation method for the roll period. [-]. Ratio of the areas under the curves for still water and in waves. [-]. The angle to which the area will be determined, according to NES 109, Issue 3. [degrees]. 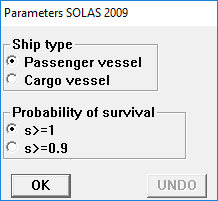 The required probability of survival s, according SOLAS 2009 for passengervessels and in case of s(final) taking into account evacuation points. [-]. GZ value at angle of equilibrium (in case of defined moments). Angle for which the largest value for GZ occurs. Angle for which the GZ becomes negative. Largest of the calculated (defined) angles that the GZ is calculated for. Total area under the positive part of the GZ curve. The required area under the curve for vessels with a large B/H ratio (alternative criteria according to the Intact Stability Code) = 0.055 + 0.001 × (30-angle at which the maximum GZ occurs). The required area under the curve according to ‘High Speed Craft Code 2000 edition 2008’ = 0.055 × 30 ÷ minumum(downflooding angle, angle of maximum GZ, 30 degrees). The required area under the curve according to the MCA small multihull rule (MCA brown Code, §11.1.2.6.1) = 0.055 + 0.002 x (30-angle at which the maximum GZ occurs). The required area B for semisubs. However, this function has not yet been implemented. The rolling angle windward as defined in the Intact Stability Code. For application of this parameter, please verify that in the Hulldef module the correct properties are defined at the applied wind contour (such as bilge shape and bilge keel area). According to part IV, regulation 2.1.5 of the Rules for the Classification and Construction of Sea-Going Ships from the Russian Maritime Register of Shipping, 2014. This rollback angle is virtually identical to that of the Intact Stability Code, there is a small difference in the X1 factor, which is given for a somewhat larger range of B/d. Furthermore, there is an exception for dredgers in regulation 3.8.4.3, which is the correction factor X3 for the windward rollback angle in case of a restricted area of navigation. If at the definition of a stability requirement a specific wind pressure is set (see Wind lever for that) of less than 51.4 kg/m2, then the navigation area is assumed to be restricted, and hence the X3 applies. It is possible to verify whether X3 has been applied by inspection of the .str file with intermediate results, because there it will be printed if applicable. The minimum G'M based upon, IMO A.265 regulation 5. C factor for container vessels according to the Intact Stability Code. For this factor the vessel should be defined including hatch coaming (if present). Breadth 2 ÷ (100 × freeboard 2). Obviously, the depth should have been correctly defined in Hulldef. The angle where the deck at Lpp/2 is immersed. This function does neither apply to the geometry of the vessel, nor to the defined deck line. It is simply based on the depth, as specified with the main dimensions. Depth - draft. This value is calculated with the depth as defined in Hulldef. The angle at which one of the deck line points, as defined in Hulldef, is immersed. VCG - VCB for zero inclination. The absolute trim angle in degrees, see On the various criteria and parameters an application. The remaining GZ according to formulae as defined by Van Harpen. Angle for which the residual lever according to Van Harpen occurs. The conventional order of arithmetic does not apply to the use of these operators. The order in which the operators are evaluated is simply from left to right. The heeling moments to be included in the calculations can be evaluated separately or combined. If multiple heeling moments are defined for a criterion, the GZ curve can be corrected (if necessary) for the total of heeling moments. Selecting type of wind lever. Linear, a straight line. Here also the gradient can be given, which is the inclination of the straight line. With a gradient of zero there is no inclination, which makes the wind lever to be constant for all angles of inclination. If a gradient is given, the wind lever is multiplied by the factor (1 + angle × gradient). Assume that for an angle of 40° the wind lever should amount 80% of the lever at 0° , then a gradient of -0.005 should be given. Cosine shaped, where the wind lever decreases with the cosine of the angle of inclination. Cosine squared, where the wind lever decreases with the square of the cosine of the angle of inclination. Cosine cube, where the wind lever decreases with the cube of the cosine of the angle of inclination. Van Harpen, where the wind lever follows van Harpens formulae (0.25 + 0.75 × cos(angle of inclination)3). 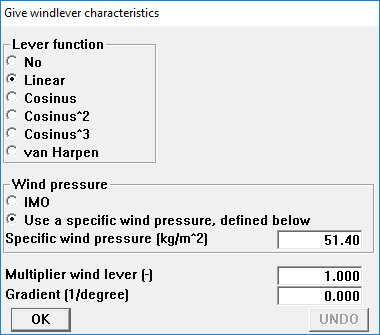 If a wind lever is present the user also should also either select one of the predefined wind pressures (as defined in the Hulldef module, at the wind data section), or give a specific wind pressure, in in kg/m2. Alternatively, a specific wind pressure in kg/m2 can be directly specified. The background of this parameters is discussed under lemma ‘specific wind pressure’ in Input data for the wind heeling moments computations. In addition, a multiplier for the set wind lever can be specified. This parameter is also discussed in the just mentioned section, under the lemma ‘multiplier on the wind lever’. When for the concerning criterion a grain-heeling lever is defined, this option includes or excludes it in the calculation results for this criterion. If this option is selected, a heeling lever due to the centrifugal force in a turning circle is applied. The lever is given by the user as a dimensionless constant, which is multiplied by the program by (KG - T/2) in order to obtain the turning circle lever for the loading condition concerned (and by displacement × (KG - T/2) to obtain the turning circle moment in tonmeter). In general, the heeling lever of the turning circle moment decreases with the cosine of the heeling angle, however, that still has to be set by the user (leaving the freedom to choose another function, such as linear). A shift of a weight can be included for evaluation of a criterion. Both weight and dislocation can be defined. The GZ curve will be calculated including the effect of the dislocated weight. An external heeling moment can be included. The magnitude of this moment can be defined, and the behavior of this moment can be selected, similar to the wind lever, see Wind lever. For each individual variable, as used to compute the value of a parameter. This is specified with the cell ‘Incl. heeling moments’ or ‘Excl. heeling moments’. For the entire criterion, at the field ‘Applicability criterion’, where ‘The GZ curve only’ or ‘The GZ minus the heeling moments’ can be entered. These two configurations have a distinct application. The first is valid for the line on which it occurs only, and determines whether the actual value of the variable should be determined including or excluding the heeling moment effect. If, for example, in a line the variable ‘Statical angle’ is used, this configuration determines whether this is the statical angle determined with or without heeling moments. The second configuration applies to the entire criterion, and determines whether it should be applied on the GZ curve only, or on the GZ curve corrected for heeling moments. Suppose a criterion requires a minimum value for the maximum GZ, than this criterion s such is not related to any heeling moment (regardless whether the criterion value should be derived taking heeling moments into account), so it is applied on the GZ curve only. However, should the criterion require a minimum lever between GZ curve and heeling moment instead, then it is applied on the GZ curve minus the heeling moment. One particular type of basic criterion, as discussed in Types of basic criteria, is the external table of maximum allowable VCG'. This criterion can, for example, be used to process maximum allowable VCG's as determined for the probabilistic damage stability, with the Probdam module, in tables or diagrams — or in the LOCOPIAS on-board loading software. These tables can be defined for multiple trims, while multiple sets of tables can be defined. Only the selected set is used for the determination of maximum allowable VCG'. 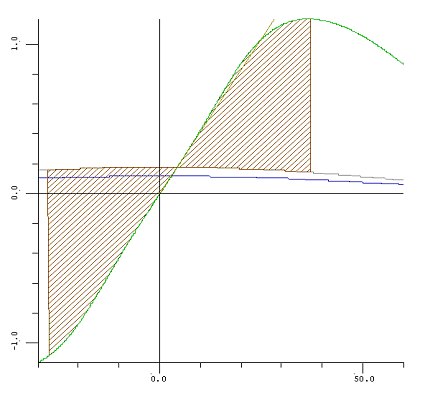 Maximum VCG's for intermediate values are determined by linear interpolation. Please keep in mind that for probabilistic damage stability according to SOLAS-2009 the VCG' between the three standard drafts - light, partial and deepest - must be determined by linear interpolation on G'M. So, in this case these values must be defined at this option as G'M values. In the toolbar of the external table sits an option [Settings] where several settings with regard to the whole table can be modified. That at the drafts the defined values are interpreted as G'M or VCG'. If this is not turned on, then in case of drafts or trims outside the defined boundaries, the stability will be assessed as insufficient. In the situation that it is turned on, then for the drafts or trims which are outside the defined boundaries, the nearest values are used. So, there will be no extrapolation outside the defined range. All basic requirements take implicitly and irrevocably into account the non-watertight openings: weathertight openings may not be submersed at the static angle of inclination. Beyond the angle of submersion of open openings the curve is terminated, so the GZ in that range is not taken into account when evaluating a requirement. If the criterion ‘Maximum angle in weather criterion Intact Stability Code’ is the determining one, it is possible that although in the summary of a loading condition the maximum allowable VCG is less than the actual VCG', the program reports that the loading condition complies. This effect is caused by the formula for determining the ‘Roll angle windward’ in which the uncorrected VCG (that means, uncorrected for free surface effects) must be applied, and this value might in a real loading condition differ from the assumption for determining the maximum allowable VCG (where there is obviously no separation between real and virtually risen VCG). According to the text of the Intact Stability Code (IS) is the ultimate parameter that determines whether the wind criterion is met, is the surface on the right side of the GZ curve b, which should be larger than that on the left, a. PIAS uses a slightly different parameter: b is set equal to a, and the roll angle is determined at which this is exactly the case. This angle may not exceed the maximum — usually 50°, or when an opening is submerged. This presentation is a bit more appealing for a human than the IS view, because inclination angles are a more intuitive notion than some area under a GZ curve. Obviously, eventually the conclusion is exactly the same. Extent for determining the minimum lever of the area under the stability curve. Some damage stability requirements have been nicely conceptualized, but may turn out a bit unexpected in practice. For example the requirement that ‘within a range of 20° from the statical angle of inclination’ a minimum area or lever should be present. Take for example the case depicted in the figure below, which shows two GZ curves. The red one is evidently better than the green one, because of its larger area and smaller statical angle of inclination. However, the ‘within a range of 20°’ plays foul, because the statical angle is A, which makes ‘plus 20°’ to be situated at C. And because of the flat character of the GZ in that region the area is small, too small to fulfill the minimum requirement. With the green curve the statical angle is B, which ‘plus 20°’r leads to D, resulting in a much larger area. 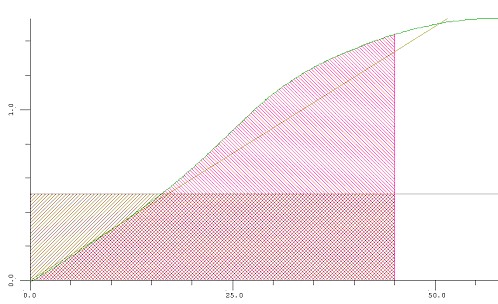 The result is that the better GZ curve does not comply, while the worse does. Two curves of righting levers in damaged condition. As such, this finding is not new, at SARC this phenomenon appeared in 1989 for the first time. And the solution is simple, by not taking this 20° from the statical angle of inclination, but from any angle between the statical inclination and the maximum allowable inclination instead. In PIAS this is achieved by subdividing this kind of criteria in many (more than ten) sub-criteria which each cover a piece of the search area, and taking the best. For the legislator this is also charted waters, as illustrated by the text of MSC/Circular.406/Rev.1 — Guidelines on Interpretation of the IBC Code and the IGC Code — (adopted on 29 June 1990), which reads: ‘....The 20° range may be measured from any angle commencing between the position of equilibrium and the angle of 25°....’. Also classification societies might be aware of this effect, given the figure below with an interpretation by Germanischer Lloyd. However, it is never guaranteed that this position is recognized in all cases, so it is advised to inquire in advance. 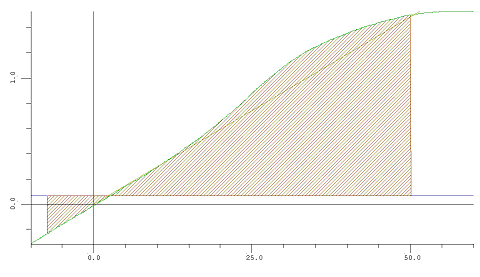 Interpretation of GL for the calculation of the area under the GZ curve with the IGC Code. An occasional stability regulation contains a criterion of ‘G'M at equilibrium’, so, at the statical angle of inclination. However, for this criterion multiple solutions may be possible, in other words, multiple KG's where G'M exactly matches the criterion value. Moreover, in general an increasing KG' will be detrimental for stability, but for this criterion this need to be not so: with the rise of K'G, in an asymmetrical damage case, the equilibrium angle will increase, so it may shift to a steeper part of the GZ curve. Where the G'M is larger, and this criterion is better matched! The general assumption is that a diagram of maximum allowable KG' contains a single transition line between areas of sufficient and insufficient stability, but with this particular criterion this does not hold because the diagram can contain islands of sufficiency or insufficiency. The search procedure of PIAS will find a single transition KG', but there may be more. Standard (item 50.200.10 of the price list). Naval criteria (50.200.30), everything related to ‘naval’, such as DDS-079, van Harpen and NES-109. Incorporation of the bollard pull moment into the stability analysis. Stability criteria for tugs, according to Bureau Veritas (2006). Will be superseded by Intact stability Code 2020 self and tow tripping. Stability criteria for tugs, according to the Commonwealth of Australian Gazette no. P3 (11 mei 1981) sect 8, C10. The parameter Absolute trim angle, to accomodate the combined heel and trim, as required by chapter 17.07 of the ROSR (vessels on the river Rhine). The parameter Area MCA small multihull. This is similar to the required area for supply vessels, but with a small difference: 0.055 + 0.002 × (30-angle at which maximum GZ occurs) instead of 0.055 + 0.001 x (angle at which maximum GZ occurs). Is applied in the MCA small boat Code (brown Code) for multihull vessels (§ 11.1.2.6.1). Bollard pull function ‘Self tripping’ according to, Intact stability Code 2020 (MSC 97-22-Add.1, 2.8.4.2). Bollard pull function ‘Tow tripping’ according to, Intact stability Code 2020 (MSC 97-22-Add.1, 2.8.4.3). The basic criterium ‘s(final) (probability of survival) and s(intermediate) (probability of survival)’ and parameter ‘Probability of survival s(final) and Probability of survival s(intermediate)’ for SOLAS 2009, with regard to passenger vessels, according to Consolidated text 2014, part B-1, regulation 8-2. The sets of predefined standard criteria do not offer a complete and up-to-date survey of all stability criteria. The user should always check the applicable stability criteria with the authorities concerned. Because criteria are often prone to interpretation, users must check for themselves that the requirements are defined according to the prevailing interpretation. Users are able to change selected predefined sets of criteria to meet their own interpretation. A consequence of the flexibility of the system is that it is not possible to check whether input data are realistic or even possible. It is, for instance, possible to define contradictory criteria. PIAS users are expected to be capable to investigate whether a certain criterion yields the correct results. It is recommended to generate and check intermediate results in case of unclear or unexpected results.